We're putting together the final touches for our Spring Pop-Up Shop and couldn't be more excited to have some of our favorite No. 41 goodies available for you this Sunday! 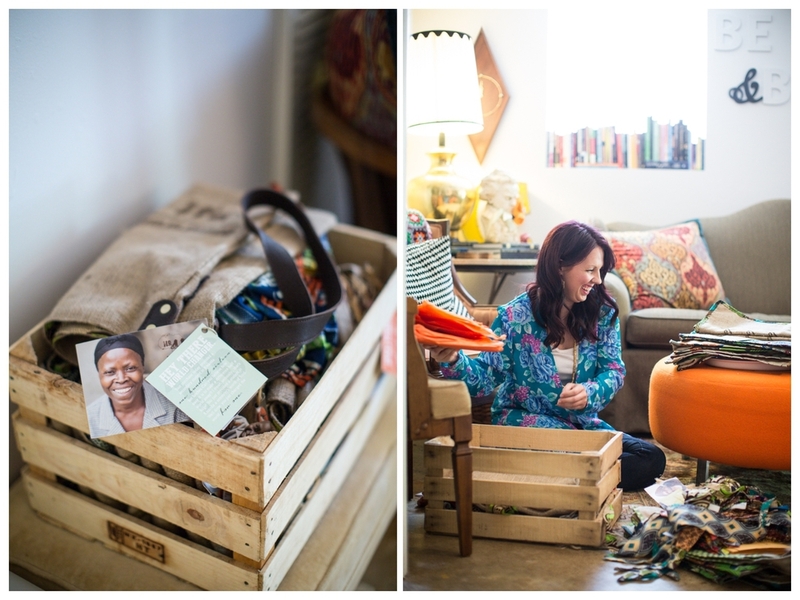 Last fall, Ashley had the opportunity to visit the shop in Rwanda (you can see images from her trip here), and then during our recent trip to Nashville we had the pleasure of meeting Tara, the creator of No. 41 and getting to know more about her passion and the story behind this wonderful organization. After falling in love with the people of Rwanda, Tara saw a great need for education especially among young, orphaned women and so began teaching the ladies how to sew -- a skill relevant to their culture and something that could sustain them beyond tomorrow. Proceeds from the handmade goods go towards educating the women and feeding 900+ children at the local school (read more about their mission here). The organization goes beyond just caring for the physical needs, however, and prioritizes the emotional and spiritual needs of the girls. We're so proud of No. 41 and constantly encouraged by Tara's motivation and heart. Take a peek into her Nashville studio apartment and be sure to stop by the shop on Sunday to purchase your own No. 41 product! We are interested in how creative folk balance work + family/friends. How do you manage time for all the important things and people in your life while managing an organization overseas? I think the balance is difficult, no matter what, and it’s not something I have been very good at; however, since moving home from Rwanda and moving from Oklahoma to Tennessee, I have quite a bit more time to myself and time to devote to growing No.41. It’s a good season and one I’m thankful for. Aesthetics have always been important to me. I think the beauty and function of a space makes all the difference in how you feel. I can remember so many times after school coming home and redecorating the living room before my mom came home from work. I got to completely redo my bedroom for my 12th birthday and I remember pouring through catalogs marking everything from bedding to artwork, planning it all down to the DIY splatter painted mini blinds. Recently moving to Nashville has me overflowing with inspiration, new people and new experiences everyday. I’m a big fan of change, I think it’s exciting, but I feel like my feet are more firmly planted than they have been in a while. How does working with No.41 affect how you see the world? I am constantly converting dollars spent into meals fed. If I spend $60 to fill up my gas tank each week, it’s mind-blowing to understand that I could have fed a child at school for an entire year with that same $60. Each casual trip to Target is an opportunity to realize that I have been given much and from me much is expected. Being your own boss can be a tricky thing. What is your favorite thing about owning your own business/non-profit? I think there are a ton of perks; the very best one has to be sleeping in. I’m a night owl and a procrastinator, so I can often be found flitting around during the day and then burning the midnight oil. I like to start my mornings at the crack of 9am. I would say one of the biggest challenges has to be cultural differences. Things that just seem totally normal to us could be completely unheard of to them. Our greatest blessing, for so many reasons, has been hiring a local program director. Absolutely everything goes through his filter and I can say that, without a doubt, we would not be in business without him. Was there ever a point in your career when you wanted to throw in the towel? Can you describe how you overcame that and kept going? There have, most definitely, been some really tough days. I can’t say that I have ever thought about throwing in the towel, mostly because I never intended to start this business, and I have never been the one to sustain this business. I know that the work we do at No.41 is for something so much greater than myself and a quick reminder of Who we are working for and those impacted, sets me straight. How do your family and friends encourage you? I am so encouraged by those around me running their own race, digging in to the gifts they have been given. I can’t say that we share the same experiences, but I am surrounded by great leaders, and great mothers, overcomers, and differences makers. My mom has been a cheerleader and workhorse, behind the scenes, of No.41 since the beginning; I get tears in my eyes when I think about how she has taken on my dream and my Rwandan family as her own. What medium or colors get you most excited? Different and eclectic is my mode of operation. I’m not matchy or conventional, I like to mix it up and make it fun. Early and often with cream, no sugar. How do you unwind from the busyness of life? Wine and wine. Most productive place to work? There are probably more productive places that I could work, but I can most often be found on my couch with laptop and my lapdog. Favorite place to visit for rest? Anywhere outdoors. A park and a blanket, a sunny day and a roadtrip, a starry night and some music…. Be sure to stop by Hart + Honey this Sunday from 2-5pm for No. 41 bags, headbands and aprons along with several other goodies from local artists.